Cydia is a application for iOS that allows you to download free premium apps, cracked apps, themes, lockscreens, tweaks etc. It is a substitute to Apple's app store but for jailbroken iOS devices. In order to use Cydia app store you have to first jailbreak your iOS device whatever it may be iPhone, iPad or iPod touch. Then you can install Cydia on it. Once Cydia is installed then you can use Cydia app store to download apps for free (or at cheap prices). Here I have discussed some of the Cydia app store features and reviews. See - What is Cydia? As you can see this Cydia homescreen with a welcome message. This is your Cydia app store. Cydia was developed by Jay Freeman in 2008 with the company name Saurik IT. And in just three years he reported his company's revenue to be $10 million. It was quite a growth. For now you can just tap on "Cydia Store" button and enter the Cydia world. Cydia app store works basically with two things "Cydia Sources/Repositories" and a "Search Box". Here is a brief intro for both. Tapping the "Manage" option in the bottom bar. Then on "Edit" in the top right corner. Now on the "Add" button in the top left corner. The above pic shows the "Manage", "Edit" and "Add" options. After tapping on add a dialog box appears asking for Cydia/APT URL. Here you have to enter the Cydia repository(repo) URL. If you need an example you can view this post on how to add "repo666.ultrssn0w.com" to Cydia. 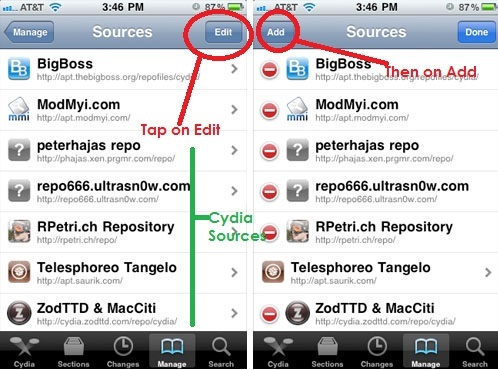 You can view this post about best Cydia sources for iOS. It contains some of the top Cydia sources/repositories that you can add. You can also use these repositories to add app collectors that will further allow you to download more apps easily. Some of these are AppCake, vShare, iFunbox, download Appsync Unified which is a must to run all cracked apps and you can install AppAddict. Cydia search box is the back bone of Cydia app store features. It is the key to find and download all the premium apps, cracked apps, themes, lockscreens, tweaks etc. after you have added the repositories. You can see the search icon at the bottom corner of Cydia app. Just tap on it and a search box will appear. Type in name of the app you are searching for and hit search. Results with appear along with the name of the repo from which they will be downloaded. 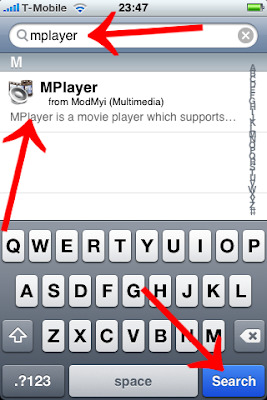 Like in the above image "mplayer" is being searched. Its a cool movie player and as you can see it is available on ModMyi repo and so it is showing that. If I would have not added the ModMyi repo the result would not have appeared. Once the result is appeared just tap on it and select the install button in the top right corner. Your app will be installed instantly. You can download whatever you require for your need or just for entertainment purpose. You can download Facebook videos on iPhone using Cydia , download GTA Vice City in iPhone/iPad for free, themes, popular Cydia lockscreens tweaks, TV serials and movies using Movie Box app and much more. You should check out this post about top cydia apps for iOS. It is updated regularly with cool apps to download from Cydia app store. These were basic Cydia app store features. And in the above way you can use Cydia app store to download apps for free. If you want you can also try Cydia app store hack to get free in app purchases. Do try Cydia if you are fascinated and you haven't tried it yet. It will give you a mind blowing experience. Enjoy!